Remodeled Top Floor End Unit#49. Luxuriously Appointed, Sunny & Close to Beach! Fully updated condo with new open concept kitchen featuring stone counters, kitchen bar, stainless steel appliances, plantation style custom solid wood cabinetry and modern task lighting. Luxurious tiled bathroom also has new plantation cabinets and lighting, tiled counters, and a fully tiled walk-in shower with bench. The condo has been newly decorated with classic Hawaiian interiors and furniture. The living room includes a brand new queen-size sleeper sofa and the master bedroom has a new cal king sized bed. Condo #49 is on the second (top) floor, and is an end unit allowing for three walls of louvered windows to let in the Hawaiian sunshine and breezes. It is located in building 9 which is close to the beach (a 2 minute walk) and far from the main road, which makes this unit quiet and convenient. You can't get closer to the beach than this without paying for an ocean view. Resort laundry facilities are just a short walk from the front door. Our condo has a magnificent garden view. The private balcony looks out over the green lawns, twin bridges and brightly colored gardens, and is a perfect place for enjoying the pleasant breezes and radiant sunsets. Known as “The Garden Island”, Kauai is the oldest of the five major Hawaiian Islands and is unique in its diversity. The island is 33 miles long by 25 miles wide and is sheltered by Hawaii’s biggest reef. Over 680 exotic species of fish can be seen while enjoying the warm Pacific Ocean or when exploring the Wailua, Hawaii’s largest body of freshwater and longest river. Other spectacular sites include the magnificent Napali Coast and the Waimea Canyon (the “Grand Canyon of the Pacific'). Kauai has maintained its friendly and slow-paced rural lifestyle and has preserved its many gems including hidden gardens, untouched tropical forests and uncrowded golden sand beaches. Bob and Flo Scarff visited Hawaii in 1976 and flew to Kauai for the day on a whim. There they discovered Kiahuna Plantation, which at the time was still under construction. 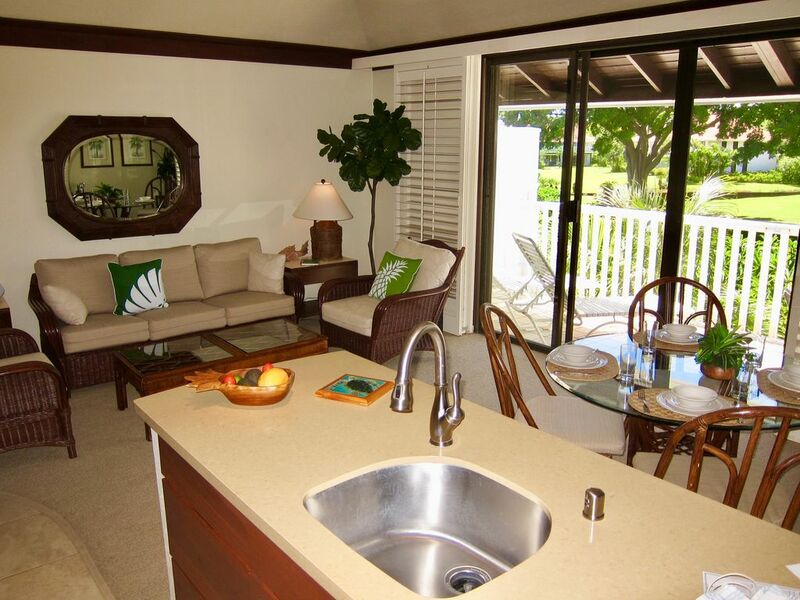 They were immediately sold by Kiahuna’s unique beauty and unit #49’s great location within the resort. While the Scarff’s still continue to visit, today their daughter Dianne Chandler and her husband Jim, and their grandson Preben Martin and his wife Nicole are the owners. The family’s love of Kiahuna has carried into a third generation, with #49 remaining a true home away from home. 2 minute walk to the beach and far off of the main road. New stainless steel appliances, fully equipped (even plastic glasses for the beach!). Totally remodeled with new countertops and cabinets and appliances. We really enjoyed our stay at Unit #49 at Kiahuna Plantation. The unit was clean and thoughtfully staged for guests. Excellent location in Poipu. There is no air conditioning but we had no problem with that and enjoyed ample breezes throughout the unit. Beautiful views and lovely open lawn with one of Kauai's beautiful beaches just beyond. We saw monk seals on the beach in front of Poipu Beach and enjoyed each evening's sunset impromptu gatherings under the palms. Took a bit to get used to the noises of the complex due to the open air environment. This corner unit is so private, and you get all the breezes. It is equipped with everything you need in the kitchen, and is close to the laundry mat and the path accessing Poipu beach (a 5 minute walk), the calmest place to swim and snorkel (and where you have a great chance of seeing monk seals, and I got to see a sea turtle). The place is simply but nicely decorated, and you feel at home right away. I was very happy with it. The view from the lanai is of the garden, three gorgeous, huge trees, very calming. Easy parking in front of the condo. Thank you for sharing your lovely condo! I felt at home, and began to relax and enjoy my vacation immediately. The recent remodel shows off the condo to its advantage in lighting and airiness allowing the ocean breezes to gently drift threw. The view from the lanai was stunning of the garden, which I enjoyed every morning while drinking my Chai. A variety of bird species would often join me hopping about the lanai, from sparrows, Mourning doves, red-crested Cardinal, Laughing Thrust, and roosters in the distance. The condo was filled with everything one could need during their stay. The kitchen was supplied with every culinary tool, having been a chef for over 10-years I appreciated this greatly. The BBQs on property are easy and convenient with several located throughout the Plantation. The closet was filled with surf & boogie-boards and an array of children's beach toys, as well as numerous books to choose from about the area and culture. I brought my iPad and was able to use the Wi-Fi to listen to my Hawaiian music on Pandora. I also brought several movies and used the TV DVD player. In recent years, Poipu has blossomed in that it has everything one would need, amazing food, shopping, great locations to snorkel, and stunning morning walks (from the Kiahuna Plantation along the beach to the Grand Hyatt passed historical Hawaiian fishing shores; about a 2 hour walk round trip). Directly across the street is Poipu Shopping Village where there is a Starbucks and sundry store called Whalers Market that carries alittle of every thing if you don't want to drive to Lihue or Ka'paa. They also have two great restaurants: Keoki's and Roy's. I still prefer to grocery shop at Safeway in Ka'paa, but purchase specialty items at Living Foods at the Shops at Kukui'ula, where they have an amazing selection of fresh fish caught only hours previously, such as Sea Bass, Mahi Mahi, Ahi tuna, & Ono. They have delicious home-made sauces (Romesco & pesto) and spreads (hummus) that go perfectly with fresh local fish. If you don't feel like cooking, just steps away are Bubba's burgers, Josseline's Tapas (great sangrias), Tortilla Republic, and Merriman's. Capt. Andy's 2-hour sunset cruise (a must! ), dinner at Red Salt (try the Red Coral Martini), Beach House for snorkeling if you want to swim with Sea-turtles also the restaurant is great for romantic sunset cocktails or dinner. Well if you have read this far you know what I did on this trip! ~ Aloha & Mahalo! Found the site very pleasant, with excellent support staff and an attractive location. Owners were supportive in arrangements. Absence of the pool within building complex itself noted. Facility is 35 + years old and shows age a little outside, but has little impact on enjoyment. Interior of this unit, 49, recently upgraded with remodel, nicely done. We loved your condo at Kiahuna Plantation, it has a beautiful setting looking out over the gardens from the second level. We were so close to the long beautiful beach and were able to see whales from the shore while we were watching the beautiful sunset every night. The condo was beautiful and so close to shopping and great restaurants in the Poipu area (usually sunny and warm). The monk seals love beaching themselves on the sandy beach and were amazing to observe. So much fun, we would recommend this condo to anyone seeking to spend time on the beautiful laid back island of Kauai. Kauai is stunning, Kiahuna Plantation is the perfect location, and the owners of the condo have done everything to ensure a perfect visit to paradise. Thanks for sharing this amazing condo with us. Many nice shops and restaurants within a short walk of the condo. The beach front location enabled us to swim every morning before our other adventures discovering this amazing island. The beach is absolutely perfect for swimmers of all ages and abilities, very safe. We could even snorkel there, and we swam with the sea turtles! The condo is a perfect place to base your travels, and the owners have done a great job with upkeep and provide all amenities you could need or want. Malaho! *Please contact for stays shorter than 7 days. Where there is availability we are happy to accommodate shorter stays. Higher rates may apply* Hawaii State taxes of 14.96% will be applied to rental fees. Cancellations: Must be received at least 60 days prior to arrival for full refund of deposit unless rental is between Dec 15 and Apr 15, in which case one-half of deposit is refundable if cancellation is 180 days prior to arrival. At check-out guests are responsible for payment to Castle Resorts for a midweek cleaning fee of $70 for each seven days of rental and a check-out cleaning fee of $160 (state general excise tax, currently 4.712%, applies to these charges). There is a mandatory mid-stay cleaning for stays of 10 days or longer at the rate of $80. Additional cleaning services are available to guests at their option per the fee schedule below (plus state general excise tax), and are payable to Castle Resorts. Daily fee: Daily Cleaning $80.00 Towels & Trash Only $27.00 Towels, Trash, Bed $40.00 Towels, Trash, Linen, Sweep $60.00 Cribs are $12 per day. Aero beds or futons are $20.00 per day or $85 per week. Guests are responsible to Castle Resorts at the time of check-out for all charges made for additional services while at the resort. Rental Rules and Regulations stipulated by Castle Resorts apply at all times during use of the condominium. Reservations made within THIRTY (30) days prior to date of arrival for the period beginning the day after Easter through May 31, and beginning the day after Labor Day through December 14, must be confirmed in advance with Castle Resorts and cannot be confirmed until this is completed. For the period June 1 through Labor Day and December 15 through Easter, NINETY (90) days in advance of stay is needed to confirm the reservation with Castle Resorts. Within these time periods, we will need to verify availability before confirming the reservation.